my passion, my purpose — YOU! Starting Creative GIRL has been one of the most amazing things I’ve EVER been part of. The revealing of this teeny little idea that is now a sacred business … well, I’ve been part of a group birthing process, birthing of an unknown radical idea, that so many people have supported this past year. As a PR professional, I spent nearly 20 years promoting other people’s ideas, businesses and dreams. As a writer I interviewed and wrote about some remarkable, inspired and passionate thought leaders and entrepreneurs. I was gifted a front row seat to their magic powers and how they achieved their successes! I was very blessed indeed. Unbeknownst to me I was in training for something really important, so very needed in our world. After the interviews, while listening to the interview recordings, I’d find myself daydreaming about the future and MY finding something that I was equally passionate about. I didn’t know what I’d be called to do, but I daydreamed and played with my imagination, and opened my heart and mind to things that concerned me. I am working and creating, using my talents and gifts to make a difference in the world while receiving, without compromising my values or my family. Wow. Makes me teary eyed to think about, but after a long and very pregnant pause from “my career” I have finally found myself on this path–a path that found me–and now I am smack-dab in the middle this Creative GIRL REAL-LIFE sacred-business-dream. Although I’m not making lots of profit in the way society defines success (vis a vis money), I see a TRUER profit come through this experience: The profit is YOU! The greatest gift is YOU: You lighting up in your creative abilities. You shining your joy and enthusiasm for being truly and authentically YOU, and you being thoughtful, compassionate and using your creative flair to generate kindness in your wake. You, Creative GIRL, inspire me! Two months ago I had an amazing opportunity to share the intentions and inspiration behind Creative GIRL through a talk called PechaKucha Night in Raleigh, NC. The format is 20 slides, 20 seconds per slide … GO! No holding slides, no repeating slides, just GO. It’s NOT like me to be nervous about public speaking, but never in my whole adult life had I given a public talk about something that I care so much about: Creative GIRL with its layers of beauty, potential, truth–is blossoming and becoming. Now I humbly share the talk I gave. I am deeply grateful to PechaKucha Night Raleigh organizers, Cyn MacGregor and the crew at Cynergie Studio for this opportunity and for their creation of this beautiful professional video from the evening. Wowzer!!!! (as my 4-year-old Sonshine loves to say)! What an amazing experience. I went to Carrboro, NC to be interviewed by an inspirational talk show host, Lee Anne McClymont for her program Courage Cocktail Radio. She invited me to come to share about Creative GIRL and the journey to where we are. To say I needed courage for today, well is a bit of an understatement. Even though I love talking and public speaking, this was really different for me: this was about my heart, completely from my heart for all to hear. Yes I have written online and shared with friends privately (in talking circles) about stepping away from my career, but this was the first time I publicly aired some of what happened, so I had to dig deep. I knew going into the interview that Lee Anne would be a beautiful guide and help me through. Lee Anne was so delightful, curious, gracious and supportive … I am so grateful for the blessing she is. I know with all my heart that courage is not about losing your fear, rather courage is about facing your fear and doing things anyway. In the interview I share a writing exploration we did during a previous playshop: the “I Am” poem. Here it is. Everyone can be a poet. Check out this link . You can quickly create a thought-provoking poem about the most wonderful person in the world: YOU! I’d love to see your creation, and I know others will too. There is no right or wrong, good or bad … just enjoy the words that come through you and play with them. Thank you for reading, for listening, and for playing together in this unusual way. P.S. Oooh and if you are interested in this summer’s playshops, check out this page for more details. I do not spend ANY money on advertising, so if you decide to share the Creative GIRL Web site with friends with middle-school-aged girls, maybe the world will be a bit shiny-er!? A JOYOUS International Women’s Day to all Creative GIRLS! International Women’s Day is March 8th every year — a day to celebrate and honor the gifts and talents of every girl and woman around the world. I was blessed to be part of a local gathering organized by the Place for Women to Gather (where I sometimes offer some special playshops for girls and women), in Raleigh. Last year the Sisters at The Place invited me to come up with a creativity project that we could breathe collective creative love and kindness to during the IWD occasion. I had a few ideas but nothing that had especially called me. One night I was watching NOVA’s documentary A Walk to Beautiful. It was a very emotional program describing the shunning of women in Ethiopia; women who suffered a traumatic injury during childbirth, called a fistula. The program described a transformative organization called Abraham’s Oasis and Grace Village, where women are taken, given a corrective operation, and then taken on a spiritual journey of healing. My breathe was stolen. I couldn’t sleep that night. I kept thinking about the women enduring unfathomable loss and ostracism. I didn’t know how or what could be possibly done to support them, and I didn’t have any money to contribute to their healing. A few days passed and I remembered the Sisters’ request for a proposal of a creativity project, and remarkably a lightbulb went off. I thought about different simple things we could do and make that could honor the women, and how we could send our love over the ocean through a small, inexpensive–but thoughtful love-infused–gift to lift and raise them in their power. I visited NOVA’s web site and researched the healers in the film. I was able to locate Ruth Kennedy and get in touch with her to investigate if a kindness creativity project would have any value to the women. This delightful woman guided me to determine our gift and Blessing Bead Bracelets were to be made. Blessing Beads are what we call paper beads that we’ve made with our hands and with an intention in our heart. Last month the Sacred Kindness Circle made beads that contributed to a growing bead pool. I got in touch with many friends, put out a notice to my neighbors (some I know and some are new friends) about our intentions and needs for bead donations. We collected THOUSANDS of beads. Today, during the IWD event, we strung the beads on stretchy thread, making a simple yet powerful bracelet. Each bracelet was garnished with a personal message from the maker, saying “Gobez” meaning strong and brave one on one side, and makers wrote personal messages in English on the back side. We made 90 bracelets, meaning that the 65 women who are about to graduate from Grace Village support program will receive a beautiful blessing bracelet on her graduation day. (We also have a few bracelets to gift to a local organization InterACT of Wake County–caring for women recovering from domestic violence). These bracelets were completely co-created by women and girls across my community who saw an opportunity to reduce another woman’s suffering. This experience has completely flooded my heart, and blown my mind. When my daughters and I returned from the event today and we gathered all the bracelets made by IWD women and girls: I was overcome with emotion–especially as I thought of all the women and girls who contributed so many different things to the pile of kindness. I’ve been touched by kindness before, but something about this experience literally flooded my being–like a love tsunami, washing over me. 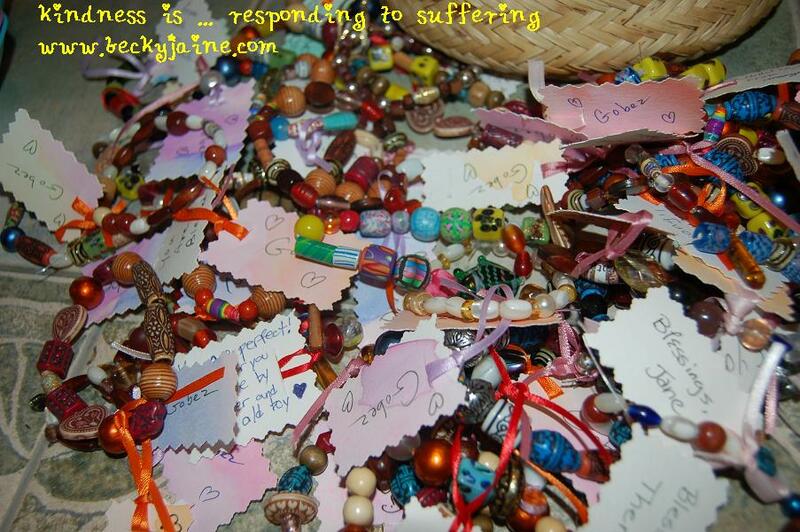 I was moved to tears for quite some time, as I allowed the love and collective kindness to permeate my being. We don’t need money to make a difference. We don’t need anything except to feel compassion and be led to action–from our self and then to expect the same from others. Through television, I experienced a disturbing situation. I googled. I reacted. I expressed my concern to friends and neighbors …. arranged all the supplies and created a sacred space for creating, and LOOK WHAT LOVE and CREATIVE KINDNESS has done!!!! 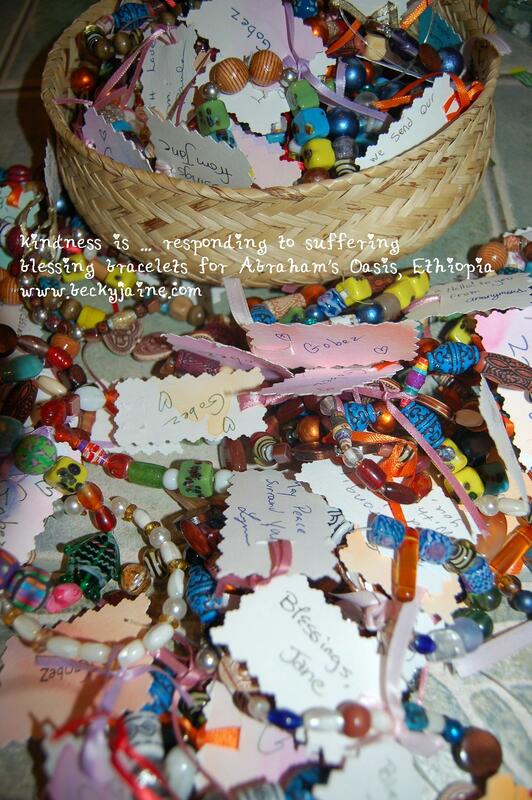 Now, to pack these beautiful blessings up and to get them to the post office destined to celebrate and honor some courageous women in Ethiopia! Never ever forget the power you (yes YOU) have to make a difference in the world. You can and DO make a difference. Feel, investigate and respond. That’s it! The secret to deep joy in life is reducing someone’s suffering.